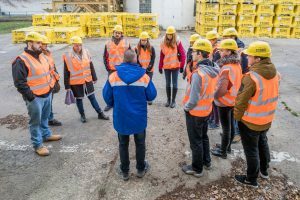 On 23.11.2018, AdMaS employees of the Microstructure of Building Materials Research Group 23 organized an excursion for Building Material Engineering students to a production plant for autoclaved aerated concrete. Students thus had the unique opportunity to see all phases of production from raw materials to building components after their expedition. The interconnection of theory and practice is one of the basic stones of study at the M field of Faculty of Civil Engineering BUT.